Our son started crawling at around 6 1/2 months old. I work from home; we have hardwood floors, full bookshelves, and split entry with wide, old, iron railings. Not an ideal situation for a freshly crawling baby and a momma trying to get some work done. I was getting up every 5 minutes seconds to move the babe back to his toys and away from something he wanted but wasn’t supposed to have. Mainly, mom’s cherished Harry Potter books, breakable decorations, and the staircase. 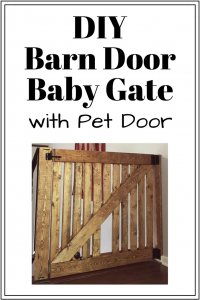 It didn’t take long for us to build a DIY barn door baby gate with pet door to block the stairs but I didn’t have a good solution for everything else, other than completely removing all items from our home. That’s when I discovered large baby playpens. 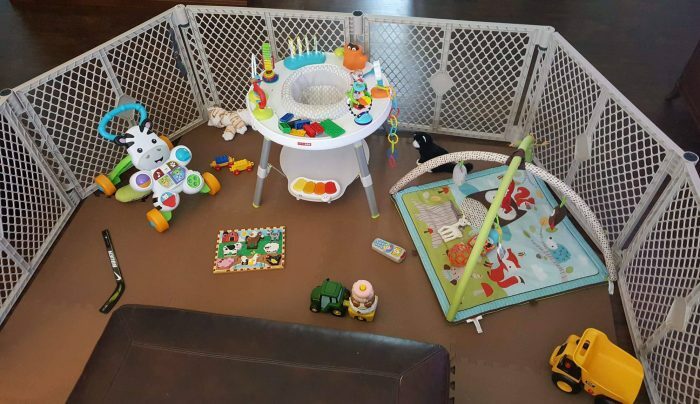 I had the basic baby proofing items you need but a baby playpen with baby play mat for crawling never occurred to me. Why?! Working from home with baby was challenging, until now! 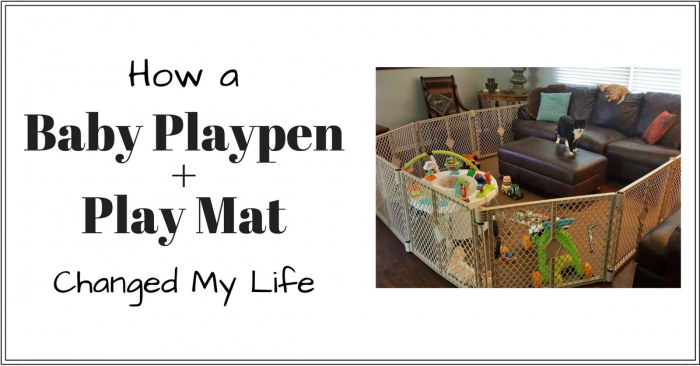 Our baby playpen and baby play mat for crawling is seriously the best baby investment since our Skip Hop Activity Center. 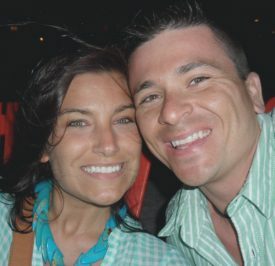 It has made working from home with Baby, and our lives, so much easier and the key how you use them. The backstory on working from home with baby: I work from home on a laptop sitting on our living room couch with all the baby toys in front of me on our hardwood floor. My husband uses the office and thinks I’m nuts for not sitting in a posturepedic desk chair at the proper height with an actual mouse and second monitor. But I prefer to be comfy and relaxed while I’m working. It’s was a breeze (for the most part) working from home with Baby… until the crawling started. Once he was on the move, I was getting nothing done. I was constantly getting up to stop him from grabbing something he wasn’t supposed to have. (I know all you work at home moms and dads feel me right now. That includes you SAHM trying to get the dishes cleaned and laundry done. It’s all work!) We have a mostly open concept living space so there was no containing him unless I worked from the nursery which was small and already completely baby proofed. And, yeah, I wasn’t going to do that. So, queue the amazing Facebook mommy groups I’m in. 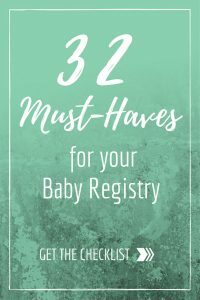 I asked those expert mommas what they did to contain their crawling baby and the unanimous answer was a large baby playpen with a baby play mat for crawling! Genius! I knew a small space would just frustrate our very active, crawling 6.5-month-old. He went from 0 to 60 overnight and hasn’t stopped moving since. I opted for the large 8-panel playpen rather than the smaller 6-panel playpen and we use it in a way that makes it huge and keeps our little guy happy. 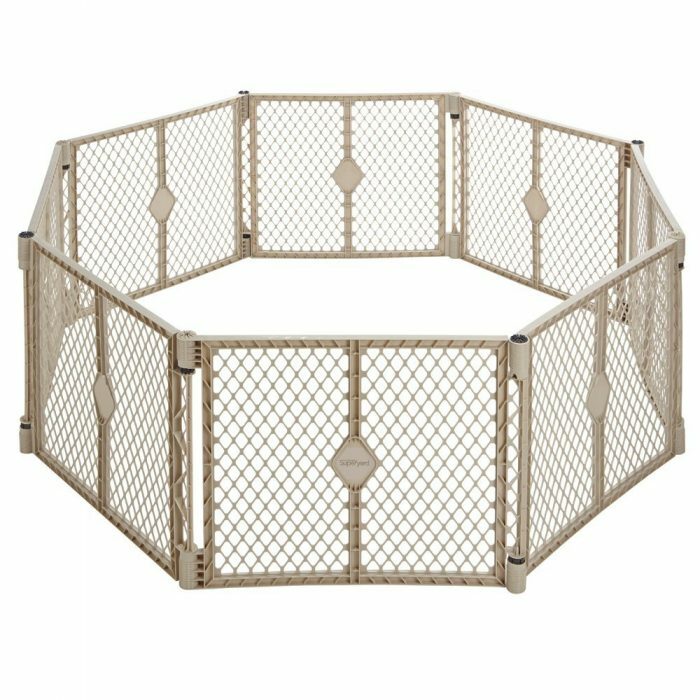 I was out with some girlfriends when the playpen arrived so my husband put it together and tested it out in its intended octagon shape. Well, that didn’t go well. Our little guy cried and cried until my husband sat in there with him. He hated being “trapped” in there by himself. 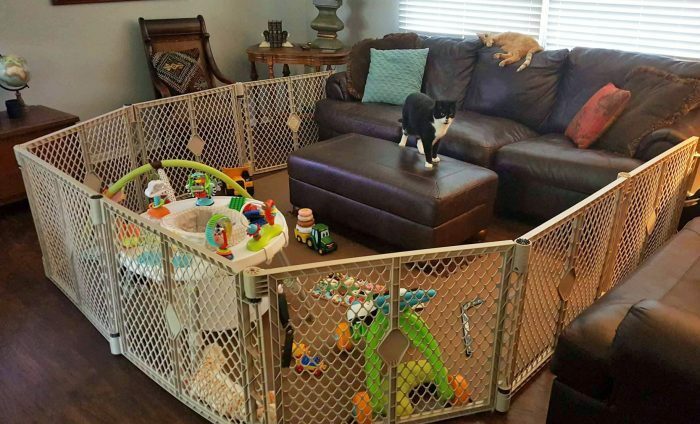 I can’t imagine what a SMALLER play pen would have caused, lol! So, my husband, the direction illiterate of the family, unhooked one joint and created a horseshoe that opened to our living room couch. The horseshoe shape allowed the babe to see us, crawl up to us, and gave him so much more room! **This is not the intended use and is not recommended by the manufacturer. We use the chairs on either side of our couch to sandwich and support the unattached gate ends. *Please Note: This is not the intended use for this product and is not recommended by the manufacturer. The Factual Fairytale recommends you follow all manufacturer instructions and cannot be held liable for failing to do so. **Please Note – I don’t recommend leaving the baby unattended in a playpen that isn’t connected on all sides. We still put him in his exersaucer/activity center or connect the playpen if we need to leave the room. My work days were so much easier. I was able to let him crawl and play but I could still easily see him and not worry he was getting into something he shouldn’t. We also use it in the evening when we’re getting dinner ready or when we’re cleaning the house, etc. It was PERFECT! …. Until he started climbing and standing on everything in sight. Hardwood floors and a climbing baby don’t mix. A baby play mat for crawling became a necessity overnight. They make a colorful ABC play mat for babies for a pretty reasonable price. Since this baby play mat was going to be in the middle of our eclectic, lodge decorated living room, we opted to spend an extra $10 and get solid color foam tile flooring that would blend in with our brown wood floors. 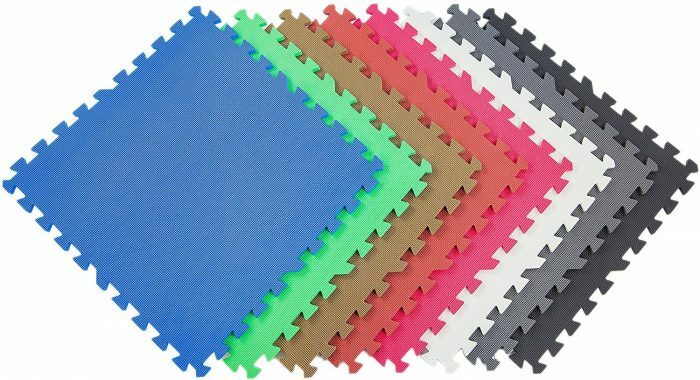 They come in tons of colors so you can match almost any decor or flooring. The size of your baby play mat for crawling will depend on how you’re using your playpen or how large your playroom is. We have a large footstool in our playpen so that left us needing about nine 2′ x 2′ foam tiles, seven for in front of the footstool and one on each side of the footstool. Falling down is inevitable when the little ones are learning to stand and walk. It’s nice to have some cushion when their nimble little legs move like lightning and I’m over here moving like a sore, old snail. Honestly, the baby playpen and baby play mat for crawling littles is the best purchase for SAHMs and working from home with Baby. SAHMs and work at home moms can get things done during the day with a crawling baby. All you need is a large baby play pen, a baby play mat for crawling, and a little ingenuity. 😉 I don’t know what I’d do without them!! Actually, yes I do, nothing! Because I wouldn’t be able to get anything done! 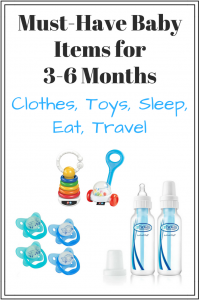 How do my fellow SAHMs and work at home moms get things done with crazy active little ones?